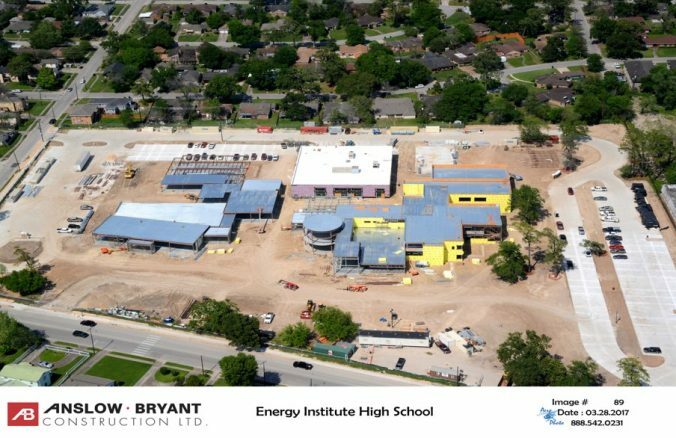 Construction on the new Energy Institute High School soon will reach 90 percent completion, with the building being furnished and outfitted with technology in the spring and teachers and staff moving in next summer. Crews are currently working on interior finishes such as painting, ceiling panel installation, and sealing and polishing of concrete floors. Installation of carpet in limited areas and outdoor canopies will wrap up this quarter, as will final mechanical, electrical, plumbing, and safety inspections. This entry was posted in 2012 bond, 21st century schools, District IV - Jolanda Jones, District VIII - Diana Dávila and tagged 2012 bond, BuildHISD, Energy Institute HS on December 1, 2017 by HISD Communications. HISD’s Energy Institute High School held a high-tech groundbreaking on Saturday as student-built robots took the lead, turning over dirt alongside school and district officials to formally mark the start of construction on their new school. The planned 110,000-square-foot building, located at 3501 Southmore Blvd., will mimic the look of a high-tech corporate environment and house the first energy-themed high school in the nation. This entry was posted in 2012 bond, 21st century schools, District IV - Jolanda Jones, District IX - Wanda Adams, District V - Sue Deigaard, News and tagged 2012 bond, BuildHISD, Energy Institute HS on November 21, 2016 by HISD Communications. Energy Institute High School held its second community meeting in November at its current location, 1808 Sampson in Houston’s Third Ward. The new $37 million school, which is using funding sources unrelated to the 2012 bond, will be built for 800 students on 12 acres of district-owned land along Southmore Boulevard at Tierwester. The planned 110,000-square-foot building mimics the look of a high-tech corporate environment, with three main buildings designed to incorporate multi-level areas for work and projects. A central courtyard with cascading stairs and trellis will expand available space for socializing and learning, and will be visible from the entryway stairs. The school is designed for project-based learning, with areas for collaboration and focused study. Construction is expected to start in the first quarter of 2016 with a target completion in the third quarter of 2017. This entry was posted in 2012 bond, District VIII - Diana Dávila and tagged BuildHISD, Energy Institute HS on January 5, 2016 by HISD Communications. Students from three HISD high schools took home prizes, as well as lessons on teamwork and sportsmanship from the recent Viva Technology STEM Showdown. The event, which took place on Nov. 6 at University of Houston, is a partnership between Great Minds in STEM and Shell Oil Company. It provides traditionally underserved high-school students in IPAA/PESA Petroleum Academies with a chance to compete in an intensive series of STEM challenges alongside undergraduate partners attending local universities. This entry was posted in District III - Sergio Lira, District VI - Holly Maria Flynn Vilaseca, District VIII - Diana Dávila and tagged Energy Institute HS, Great Minds in STEM, Milby HS, Shell Oil, STEM on November 20, 2015 by HISD Communications. Energy Institute High School students, staff, and community members on Tuesday attended the second community meeting to hear about progress on a new $37 million school for the nation’s first energy studies high school. This entry was posted in 2012 bond, District VIII - Diana Dávila and tagged 2012 bond, Energy Institute HS on November 18, 2015 by HISD Communications.